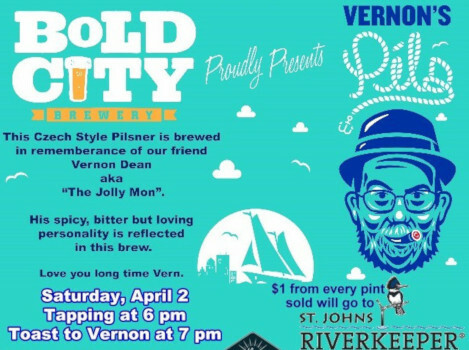 Vernon Dean, a Bold City fixture in and around the brewery, will never be forgotten by all who visited or worked at Bold City Brewery while he was here. Vernon handled chef duties for Jolly Mon Catering inside Bold City and suddenly passed away in January 2015. We have brewed a special beer in his honor - Vernon's Pilsner - which was created to reflect Vernon's lovable golden and bitter personality. This is Bold City's first pilsner.